So………..we know this artwork, we have seen it before, but as a cover it is given a new lease of life. Simply put, this piece of art suggests someone is either dead or wounded, and whoever is at the end of those weapons is following up (mopping up?). 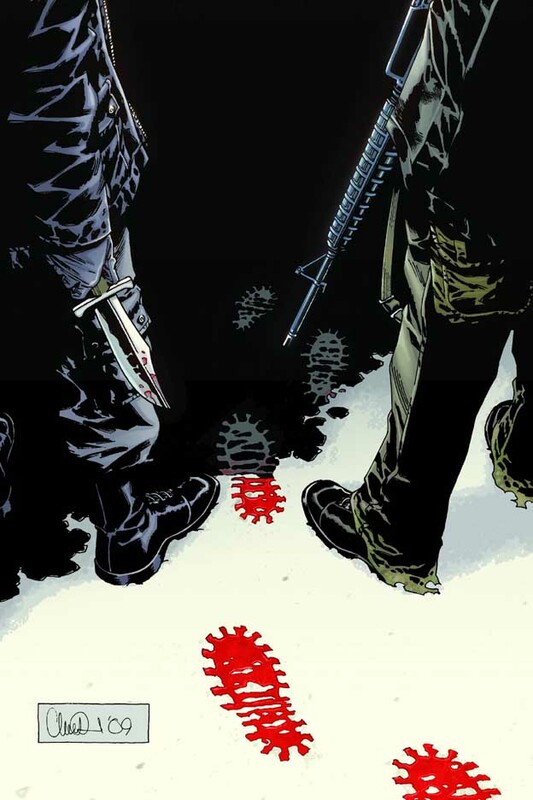 Could those bloody boot prints be from Army issue boots? Could the blood be Abrahams? The fact that the solicitation states ‘The hunt continues! Who will be the next to fall?’ means we are going to be witness to a storyline where some of the characters die. Probably. Not long to find out, providing the ‘On time in ’09’ manifesto continues (and it is holding up so far, a third of the way through the year). But please, don’t kill off Abraham!